As world events confound traditional tools and institutions, it is also a question which demands urgent answers. The faltering of global order can be seen in the realm of international security, where the international community has stood by – largely impotent – as a devastating civil war has ripped apart Syria, unleashing the worst humanitarian crisis in the young 21st century, and as the Rohingya have been violently forced from their homes in Myanmar. The conflict in Ukraine has challenged international norms of territorial integrity and raised the specter of great power conflict in Europe for the first time since the end of the Cold War. In other domains, too, the lack of global order has troubling consequences for wider human security aims, including development, sustainability and political freedom. Looking across a range of issues, from the international trade regime to intervention in humanitarian crises, major states seem to be bypassing the United Nations and other international institutions more than ever. Does this fragmentation of the global order spell the end of the liberal international system that emerged after the end of World War II? The themes that the students have grappled with include classical liberal theory; liberalism, imperialism and empire; the origins of NATO and the Cold War Order; United Nations Peacekeeping operations; human rights and international institutions; science diplomacy; the Balkan Wars and legacies; and the doctrine of the responsibility to protect. Upcoming topics include: challenging the liberal world order from within and without; populism; unreformed international institutions; and regional approaches from Africa the Middle East. Alumnus Jake Sherman (EPIIC’96) was the guest lecturer for EPIIC’s Annual Immersion Weekend with Outward Bound. 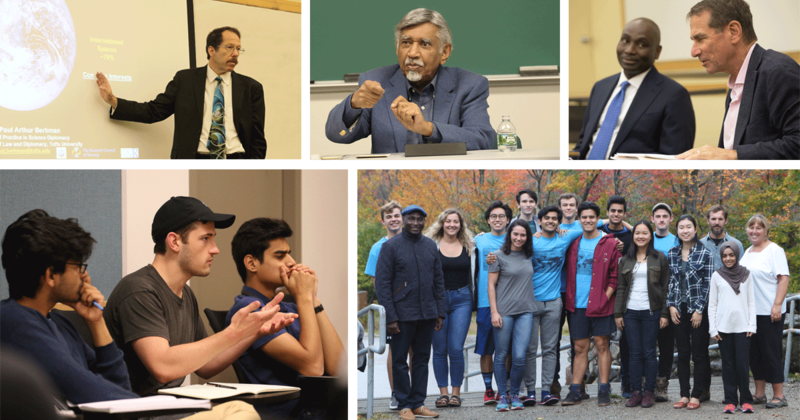 The class traveled once again to New Hampshire’s White Mountains for team building activities, a “refugee rescue operation”, and lectures and discussion on “The United Nations, Peace and Security: Prospects for Reform”. Contributing to this year’s class discussions is the diversity of places from which this year’s students hail: China, France, India, Japan, Pakistan, Panama, and the United States. As the first semester comes to a close, the students are in the midst of their committee work: the Program Committee is working to define the themes and speakers for the symposium; the International Students Committee is establishing a website and readings to interact with the more than 40 international students expected to attend from Brazil, China, Ireland, Israel, Russia, Singapore, and South Korea; and the Inquiry Committee is finalizing the outline of the simulation and roles for the more than 25 delegations of high school students.